About Junya Nakai : "I just want to make beautiful things, even if nobody cares" -Saul Bass But, he has another opinion. Making up something in order to solve problems is designing. Designing should exist for something or someone. Also, designing should be beautiful. Then in textile design, colour is very important element. Colour is not only 'trend colour' but also can express social conditions of the present. Colour is healing people. However,colour will be able to such a armor protect yourself in business scene. We select what colour to wear depending on our status of mind whether or we are not aware of it. Colour can change fabrics impression as if it is a magic! Many of my works use natural raw materials - cotton, silk, and wool etc. using natural materials which should go back to a part of the ground eventually. Linen is one of my favorites and also very popular with my customers. who has a tight-twist woven linen technology also in Europe. compared to normal linen. Because the yarn of linen will cut off when it twists strongly. However, there is the method of twisting strongly while wet the yarn with water. 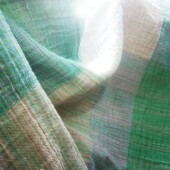 The fabric which was woven with the strong twisted yarn can make the small gap on the surface. As a result, You will get a fresh feeling when wearing it. Because the touching area of skin and cloth will be less. This fabric is very precious. This technique is the unique old technique of Japan. What is worse, this technique is going to disappear. I would like to introduce these products beyond the border. Collaborating on the project with cashmere products maker in Nepal. Japanese customers and International colleague and customer. 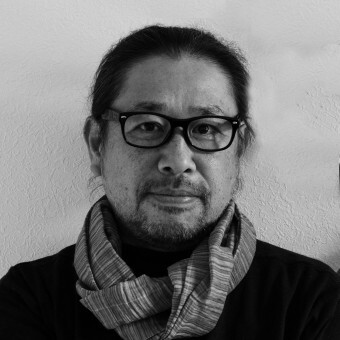 Press Members: Request an exclusive interview with Junya Nakai.